Visit our Social Media page for a blast of our multimedia activity and minute-by-minute coverage of the BDPA National events. visit bdpa.org for a full list of activities, including the career fair. Bookmark this post for quick access to podcasts, pics and more that we capture during the week long event. BDPA HSCC students from across the country are preparing for the Annual High School Conference Competition. Thousands of dollars in scholarship financing is at stake as well as bragging rights over the next year. Curtis Jenkins, BDPA Philadelphia Chapter VP of Northeast region shares insight, perspective and past BDPA party stories. Tech Expresso Catches up with National President Mike Williams during his busy conference schedule. 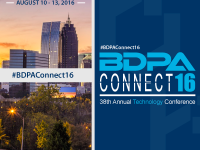 Listen in for his vision of the exciting road ahead for BDPA, Sponsors and members alike. You are here because you earned it! Congrats the the future. I am the next _________!! Launch!! Southern Minnesota team gives valiant effort during the BDPA Connect 2016 HSCC Challenge. They are all winners!! Atlanta HSCC team in deep discussion during the challenge. Eventual winners of the 2016 National competition.